Zina Escovedo wants to give Prince fans a night to remember. 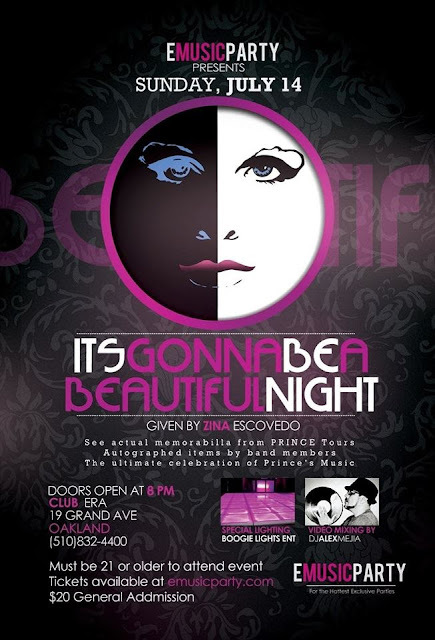 Escovedo, of E Music Party (emusicparty.com), will host “It's Gonna Be a Beautiful Night,” an event featuring the music and videos of Prince and associated artists, at 8 p.m., July 14, Club Era, 19 Grand Ave., Oakland. Tickets are $20 and can be purchased in advance. If there are tickets remaining, they will be sold at the door for $25. This is an 21-and-over event. She said that the bonuses for guests who already purchased VIP tickets will be a surprise. As of this writing, VIP tickets are sold out. DJ Alex Mejia will spin the night's music and Marcus Scott, of Beautiful Nights, will be in attendance. Johnny Viramontes, of Boogie Lights Entertainment will provide special lighting and there will also be surprise performances. Memorabilia from several former members of Prince's band will be on display throughout the night. Escovedo comes from a family of renowned musicians: her father Pete Escovedo, leads the band Azteca and worked with artists such as Carlos Santana, Tito Puente and Herbie Hancock; her oldest brother, Peter Michael Escovedo, was the musical director for "The Wayne Brady Show," and has worked with Luther Vandross, Mariah Carey and Lionel Richie; her brother, Juan Escovedo, heads his own orchestra and has worked with Earth, Wind & Fire, Barry White and Hall and Oates and her sister, Sheila E., collaborated with Prince as a solo artist and later as a member of his band, has worked with George Duke, Ringo Starr and Beyonce, led her own band, C.O.E.D., and is still an in-demand session player. They also all perform together as The E Family Orchestra. Escovedo hinted that her event could possibly turn into an after party for her father who will be celebrating his 78th birthday (on July 13) by playing a series of concerts, July 12-14 at Yoshi's in Oakland. She said she chose that weekend to have the party, because, her entire family will be in town. She added that this could be the type of bash people talk about for the rest of the year. “The Escovedos can party!” she said. This will be the first event Escovedo will host through her new business venture, E Music Party. She said she always wanted to have her own company and looks forward to bringing people of different backgrounds together through music. The idea for the party was hatched after she ran into Mejia at a bank about four months ago and they struck up a conversation about having a Prince-themed party. During the course of that discussion the two decided to collaborate on the event. They had several meetings, because, she is “particular about details” and wanted to make sure everything was just right before moving forward. She later brought in Viramontes to assist in further enhancing the party's atmosphere with his lighting and contacted artists associated with Prince to see who would be willing to share tokens from their time with The Purple One, she said. Escovedo connected with Scott after Maya and Nandy McClean, better known as The Twinz, mutual friends of the two, recommended she call him. The Twinz told her Scott was very down to earth and she did not think twice about getting in touch with him. Escovedo said that she although her entire family relocated to Southern California, she never wanted to have the party anywhere but Oakland, her hometown, because, she appreciated all the love and loyalty her family received from their fans in the Bay Area. Fans may remember her being featured in the music video for Sheila E.'s single, “The Glamorous Life,” (1984) and she was mentioned in the song “Yellow" from Romance 1600 (1985). She has also been a mainstay at many of her family's shows assisting them in any way she can, including selling merchandise at their concerts. Most of her life, she was usually in the background--which was never a bad thing-- and she observed and came into contact with all kinds of musicians, she said. She added that she thought every kid lived like that. When she got older she said she would get correspondence from fans who were excited to realize that she was part of the Escovedo dynasty-- with some people even wondering why she had not told them that she was Sheila E.'s sister-- but, to her, they were always family members first, not stars. But, now she wants to share what she realized was a unique experience with as many people as possible. She said any future parties she hosts may or may not be Prince related-- audience demand will determine what themes her soirees will have and that she wants to plan events based on what type of emotional experience people wish to have during the course of a given night. Tickets can be purchased on the E Music Party Web site. Check out the “It's Gonna Be a Beautiful Night” Facebook event page here. 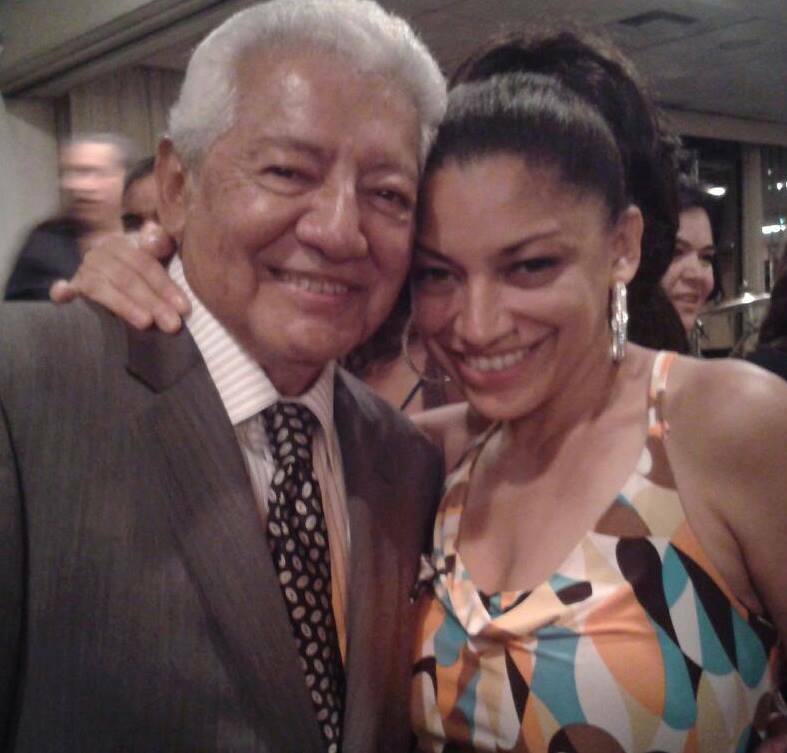 For more information on Pete Escovedo's birthday shows, visit yoshis.com. All Photos courtesy of Zina Escovedo.